Whether getting ready for or after a day of fun with your fellow Porsche enthusiasts, if you need to spend some quality time treating your chariot to well a deserved wash down, we have you covered. 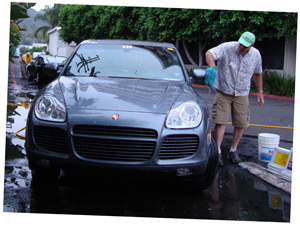 We will have washing stations at the Davenport Grand Loading Dock for washing your Porsche available throughout the day. We will have parking spaces reserved on the street adjacent to the washing area. The plan is to do the car washing in the loading dock area and then move your car to the parking spaces to complete the drying off process. If you're new to Parade, know that this station isn't your average Car wash - We wil have buckets hoses, car wash soap and towels provided by our Davenport hosts and stocked by our Parade staff. We expect Griots again this year to stock us with their products!